A fireplace in a home is usually the focal point in the room. Whether you are building your own mantel or buying a fireplace unit, you want the mantel to have a nice design that will compliment your room as well as your style. When building a fireplace mantel it is important to draw the concept of what you are looking for on paper. That way you can see the design to scale and make any changes to the dimensions and design as needed. When we were building our mantel we went through a few design concept drawings before we finally came up with the perfect one. If you are interested in building your own mantel, please watch our video on how to build a quality fireplace mantel. When it comes to building a quality piece it’s all about the details, because the details are where you will make the difference. In our video we walk you through the various parts from a builder’s perspective. Whether you are purchasing or building your own fireplace mantel, you will get some tips to help you ensure your fireplace looks great and adds value to the room. 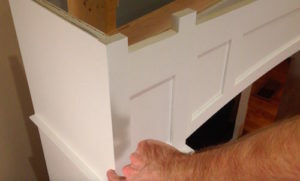 Take a look at our How to Install a Fireplace Mantel page to understand how to install your mantel.